Dave Warshaw of The Creepy Creeps in Color Ink Book art show! One of the most innovative and clever art periodicals on the market, known simply as Color Ink Book, springs from the creative minds of brothers Adam and Jason Washburn. It is Color Ink Book’s simplicity that makes it so unique and such an amazing “why didn’t I think of that” kind of idea. True to its name, Color Ink Book is on the surface just a magazine filled with black and white illustrations which the reader is welcome to color in as they see fit. But the catch is that the Brothers Washburn have the ability to lure some of the greatest artistic talents working in the contemporary art and illustration scenes into creating the eye-catching graphic artwork that graces its pages. A coloring book aimed at adults (! ), Color Ink Book not only allows avid art collectors and fans alike to afford a plethora of images by their favorite artists, but if they should get the urge to color, offer a unique opportunity to interact with artists who are often otherwise inaccessible. Color Ink Book’s innovation is why, in a time when it seemed like financial suicide to venture into print media, The Brothers Washburn and Color Ink Book are flourishing. Friday, July 29th, Color Ink Book art leaps out of the coloring books and onto the walls of WWA Gallery. 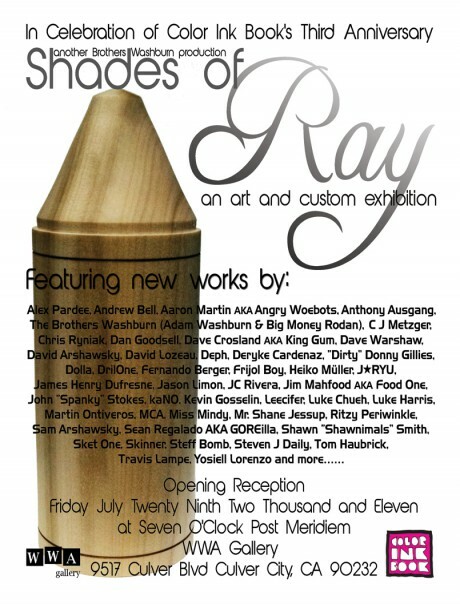 Shades of Ray – Color Ink Book’s 3rd Anniversary Showcase features the talents of Alex Pardee, Andrew Bell, Angry Woebots (Aaron Martin), Anthony Ausgang, C J Metzger, Chris Ryniak, Dan Goodsell, Dave Crosland AKA King Gum, Dave Warshaw, David Arshawsky, David Lozeau, Deph, Deryke Cardenaz, “Dirty” Donny Gillies, Dolla, DrilOne, Fernando Berger, Frijol Boy, Goreilla, Heiko Müller, J*RYU, James Henry Dufresne, Jason Limon, JC Rivera, Jim Mahfood AKA Food One, John “Spanky” Stokes, kaNO, Kevin Gosselin, Leecifer, Luke Chueh, Martin Ontiveros, MCA, Miss Mindy, Mr. Shane Jessup, Ritzy Periwinkle, Sam Arshawsky, Shawn “Shawnimals” Smith, Sket One, Skinner, Steff Bomb, Steven J Daily, Tom Haubrick, Travis Lampe, Yosiell Lorenzo, many of whom will be in attendance.